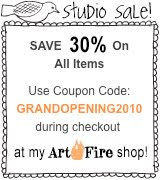 Please browse around my ArtFire Shop and see if anything catches your eye! If you have any questions or problems using my coupon code, please email me. I will do my best to help you in any way that I can. Thanks Shalana, going there now! sending best wishes and blessings on your new shop! !